Kevin is a Partner at Foley Bezek Behle & Curtis LLP (“FBBC”), practicing out of its Costa Mesa office. Kevin’s practice focuses on class and mass actions, as well as complex business, financial and securities fraud, false advertising, employment, and lender liability litigation. Kevin is admitted to the State Bar of California and is also admitted to practice in the U.S. District Courts for the Central and Southern Districts of California. Ramirez v. MetLife, Inc., et al., BC576608, Superior Court of California, County of Los Angeles: jury verdict awarding approximately $15.3 million in punitive damages based on aiding and abetting the sale of fraudulent investment in a Ponzi scheme. Bostick v. Herbalife International of America, Inc. et al. CV 13-02488-BRO, United States District Court, Central District of California: Over $17,400,000 settlement on behalf of class members in class action. Kearney, et al. v. Equilon Enterprises, LLC, 3:!4-cv-00254-HZ, United States District Court, District of Oregon: $2,200,000 settlement in false advertising class action. Beauperthuy, et al. v. 24 Hour Fitness, 3:06-cv-00715-SC, United States District Court, Northern District of California: Over $17,400,000 settlement for hundreds of personal trainers and managers in unpaid overtime and misclassification case. F&F v. East West Bank, Case No. BC462714, Los Angeles Superior Court: approximately $39 million jury verdict in lender liability action; successful dismissal of motion for summary judgment of cross-complaint alleging fraud seeking approximately $11 million from client; obtained order of attorneys fees exceeding $2,000,000. Schulein, et al v. Petroleum Development Corporation, et al., Case No. 8:11-cv-01891-AG-AN, United States District Court, Central District of California: $37,500,000 class action settlement against oil company based on violation of federal securities law. McDonough, et al. v. Knell, et al., 1415007, Superior Court of California, County of Santa Barbara, Anacapa Division: Successful defense jury verdict in which plaintiff alleged 38 causes of action, seeking millions of dollars in compensatory damages and punitive damages; after obtaining the verdict for the client, obtained an order for over $2,000,000 in attorneys’ fees and costs. 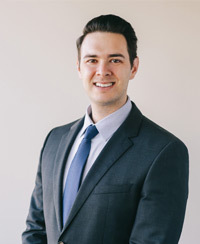 Kevin graduated from Chapman University School of Law in 2010, where he was an Articles Editor for the Chapman Law Review and also the Vice President of Mediations on the Alternative Dispute Resolution’s Board. Also while at Chapman, Kevin earned first place at the 8th Annual International Law School Mediation Tournament (Attorney Division). And, Kevin earned CALI awards (highest grade in class) in Civil Procedure and Legal Research and Writing. After his first year at Chapman, Kevin externed for the Honorable Judge James Pierce, a trial court Judge sitting in Long Beach Superior Court. During his second year of law school, Kevin served as an Academic Fellow for Civil Procedure, holding and facilitating Civil Procedure review sessions for first year law students. Kevin graduated from the University of California, Los Angeles, in 2007, where he was a member of the UCLA football team and on the Athletic Director’s Honor Roll. At UCLA, Kevin majored in History and minored in Russian Language and Literature.